Fisherman Bay, on Lopez Island, is among the premiere destinations in the San Juan Islands. It is also one of the few locations where there is no alternative to running a tricky entrance. There are boaters who never venture into Fisherman Bay due to any number of horror stories. Such tales are related, almost entirely, by others who didn’t properly research and prepare for the entrance or who made glaring navigational errors when running the channel. There is no reason to fear the entrance to Fisherman Bay, but a few considerations deserve respect. There are only about five feet of water in the channel at a zero tide. Boats that draw 4, 5, or 6 feet will want to check a tide table and be certain there will be adequate depth. The channel will be impassable to all but the most shoal draft vessels at minus one or two feet. From a tidal consideration, one of the best times to run the entrance channel to Fisherman Bay would be on a rising tide, perhaps midway between low and high water. Such conditions should ensure enough depth in the channel that properly navigated vessels will stay out of trouble. Should a boater accidentally become hung up on the bottom, the rising tide is likely to float the vessel free. Getting hung up during a falling tide is far more serious. It will be several hours until the next high water cycle, and if the tide doesn’t rise as high as it was the moment the boat went aground it may several days, or longer, to float free again. Successful entry to Fisherman Bay begins with taking to starboard the red day mark on pilings off of Lopez Village. There’s no need for speed, anywhere between the day mark and the heart of the bay. Keeping an eye on the sounder, proceed as directly between the pilings and red mark #4, (at the end of the sand spit) as practicable. Expect to fall off to port, very slightly, to maintain adequate depth. At low water, you do not want to be on or west of a rhumb line between the day mark and #4. Take mark #4 as close to starboard as depth allows to avoid some nasty rocks along the western shore of Lopez Island. 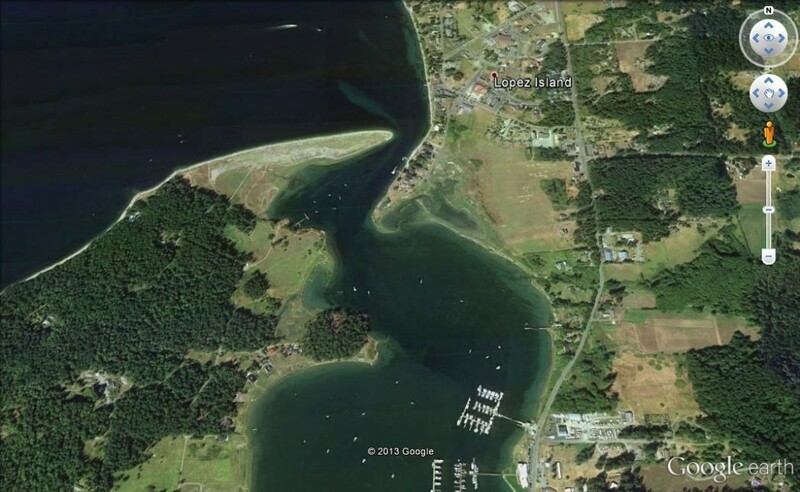 Once past the tip of the sand spit, the channel favors the port side. Gravitate toward the docks and summer homes on the port side, rather than steering for the “middle” of the entrance bay. Ease around green #5 and #7, there’s no need to be uncomfortably close to either of the green marks where the channel turns. Be aware that there are shoals to starboard, so watch the sounder carefully to avoid losing the channel. Of the boats that go aground in Fisherman Bay each year, a high percentage of them make it as far as the green marks at the turn in the channel. The common mistake at that point is assuming that where there is a lot of surface area there is likely depth as well. A serious mud bank reaches between the peninsula on the western edge of Fisherman Bay to a point about ¾ of the distance to the opposite shore. Resist the temptation to turn south into the bay until around red buoy #8, located very close to the Islands Marine Center dock.